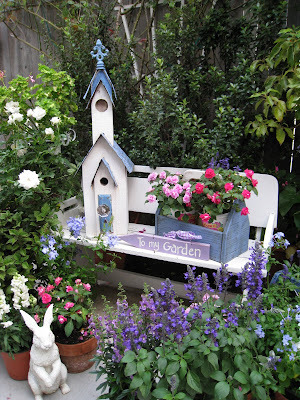 I was thrilled to open my e-mail this morning to learn that Kathleen from Musings From A French Garden (http://musingsfromafrendgarden.blogspot.com/) passed on the Fabulous Finds Award to me. This is my first blog award and it originated from Olive Rue http://oliverue.blogspot.com/. According to Kathleen the award is passed on to "insanely talented, dumpster diving, curb and flea market finds, thrifty tiara wearing , re-purposing, self-proclaimed junk shop queens ". 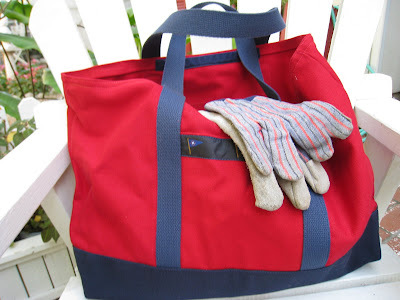 I have been insanely busy re-purposing and re-decorating my home the past month using some of my dumpster diving, curb and flea market finds, and favorite ,"free to you" finds . . . .so in order to do justice to the award . . . I thought it would be fun to share some of my finds with you. The most important item for this "Junk Queen" is my "re-purposing kit". 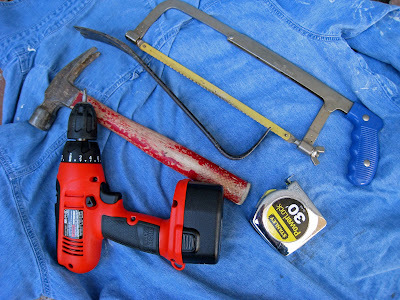 Contents of kit - denim work shirt, hammer, wrecking bar, saw with heavy duty blade, heavy duty screwdriver, and measuring tape. The wrecking bar and hammer can be used to take down almost anything! The shutters around my front door are my all time favorite found item. They were actually part of an old wooden gate that was hanging on one very large hinge. The house was being torn down and I asked permission to take the gate down. The workman said "Lady I do not have no time for such nonsense, but if you think you can get it down by yourself, have at it". I quickly removed my ""re-purposing kit" from my car and got to work with the wrecking bar and hammer and took down the gate . The workman looked at me in dismay and said " blank -blank lady" - where did you learn to do that!!!! He was very nice and put the gate in the back of my Ford Explorer and off I went with my new found treasurer. 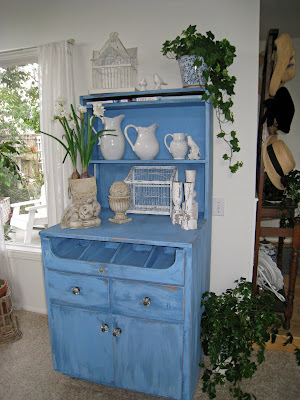 Another favorite "free to you" is my blue step back cupboard. Actually it was an old wooden tool bench with a large vice bolted down to the center and filled with tools - the little drawer at the top held screws and nails. It is on wheels and when I saw my neighbor wheeling it out to the trash I ran across the street to ask if I could have it. He was shocked that I wanted it and eagerly gave it to me to get it out of his garage. I removed the vice and gave it to my son and sanded it down and rubbed three different shades of blue acrylic paint on it. I sanded the edges to give age and added glass knobs that I purchased at Anthropology. It has a new home and I now use it to house my stereo and CD's. Another one of my favorite finds is the white garden bench. I was "junk cruising" down the alley with my friend one day and saw a man putting the bench in the trash. It was actually a seat in his Boston Whaler fishing boat and he was replacing the seat with a larger one. I painted it white and it has been at home in my garden for years. I could not bear to see these wonderful old wicker picnic baskets thrown in the trash and salvaged them just as the trash truck was coming down the street. 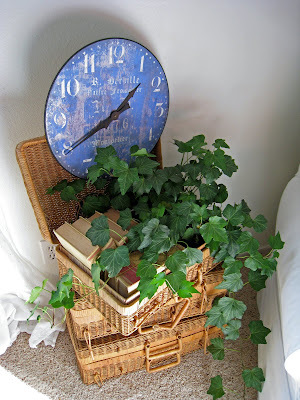 I stacked them up and store books and a plant in the old baskets. The owner of this old hall tree was going to throw it away as it fell over in an earthquake and the top and side pieces broke off. As a "Junk Queen", I saw beauty in the old broken hall tree and offered to give it a new home. 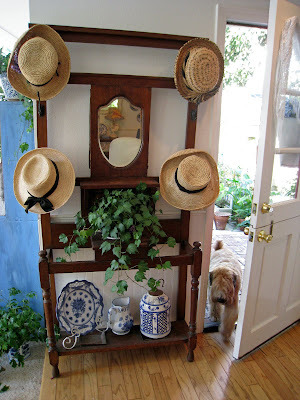 It has a special place by my front door and is perfect for hanging my garden hats and Bentley's lease. The old white cupboard was another "Junk Queen" find discovered one early morning when I was walking Bentley. It is quite large and as I was pondering how to get it home, a lovely lady came walking by with her dog. She offered to help me - I ran home and got my car and came back - all the time she was holding my dog for me. We put it in the back of my car with one inch to spare. There was also an old mirror which fit perfectly on top of the cupboard and of course, the mirror had to go home with me. When we moved the cupboard she discovered some wonderful old classic Tonka trucks which she salvaged for her Grandchildren. As I was writing my blog post about "Fabulous Finds" one of my new blog friends kept popping up in my mind as a great prospect to pass the award onto. She is a fabulous artist named Ruth who paints on fabulous finds . . . . .100 year old ceiling tiles and old recycled windows. Her work is beautiful and was featured in Hot Cottage Collectibles as well as Country Victorian magazine. I am adding the word "re-purpose" to Kathleen's description of fabulous finds since Ruth certainly knows how to re=purpose her lovely old ceiling tiles and give them a whole new life. I hope everyone has a lovely week and don't forget to keep your eyes open for those fabulous finds. Now that most of my re purposing projects are complete I will be back in the studio working on a rose heart "how-to project" that I will share with you. Hi Erin! Thanks for visiting my blog and for the sweet words you left. Congratulations on the award. I really had a blast making it. I hope to see you around again, and I'm off to look around your blog some more. Hi Erin...I had no idea you were such a salvage queen...I really admire people like that , that can take something they find and make it beautiful and work for what they need. I cannot do that at all!!!! I especially loved the story about those two shutters by your front door...that was so funny!!!! Lovely home that you have. I'm trying to open my eyes to the possibilities! You always turn your stuff into ART! You amaze me AND inspire me! This post is so much fun - I can just see you with the grumpy man taking down the gate and his shock at seeing you get it down. Hi Erin, thank you so much for the beautiful award...for the kind words and comments...they mean a lot to me. Yes, you might be right, my next painting may been an Orchid scene actually....I'm seriously thinking about it anyway. : ) Have fun painting this week. 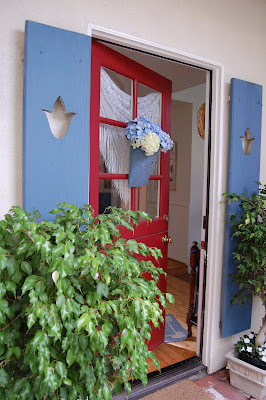 You've gotten some beautiful finds, especially the door shutters, love them! You made everything look so fabulous. I like the idea of having the re-purposing kit. I may have to do that! After visiting your blog I can see your comment you left on my latest post was left from your own experiences!! I also seem to link different objects up by colour, I seem to be initially attracted to certain "treasures" because of their colour rather than what they are. Keep up your beautiful work! I read through this post and looked at the pictures and I about fell off my chair...(and not just because I'm sick) I am blown away by your vision! I wish I could see the possibilities like you do...and then have the talent to transform them. All of your "rescues" turned into beautiful pieces. Oh and if you'd asked me to hold your dog while you went to get your car....me and Bentley would be gone when you came back lol...he's too cute not to steal! Oh Erin, you are hilarious! I have given up junk finding for full time published writing, but I used to do a lot of what you do so can relate! Love the story about the shutters and the guy who was annoyed! Guess you showed him!! I just love your painting of the sunflowers and hat on the round table! Oh, I wish I could paint. I have always envied the talent of those who could. Your work is lovely. Glad I found you.